Russian poker pro Alexander “PostflopAction” Kostritsyn is one of the biggest winners in the history of online poker, and he is currently up $2.7 million this year, according to data from HighstakesDB. However, he’s really not all that impressed by his 2013 run. “Actually in the big-bet games, it’s not that big of a [winning streak],” Kostritsyn said Saturday before the restart of a $5,000 buy-in Omaha tournament at the 2013 World Series of Poker. 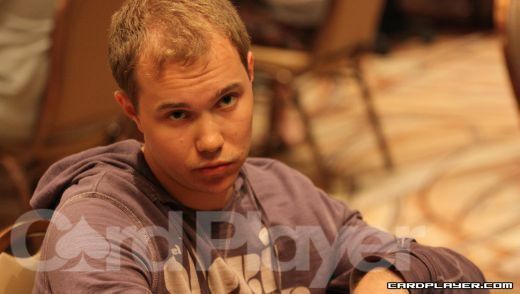 Kostritsyn returned to the summer poker festival after taking last year off. It wasn’t a downswing, or a desire to focus on the online action and the big private games in Russia that caused his absence. His wife had a baby and the poker pro wanted to spend time with his family. However, he of course has been consistently playing huge games from the comfort of his home. On the tournament circuit, Kostritsyn has won more than $3 million. His breakout tournament performance came when he beat Erik Seidel heads-up at the 2008 Aussie Millions. On Saturday at around 4:30 p.m. local time in Las Vegas, he was still alive with 18 left in the Omaha eight-or-better contest, the 25th event of the Series. A total of 241 entered. Stay tuned to CardPlayer.com for a recap of the event, which will award the winner $277,519.